The storyline I had planned for The Gilded Scarab isn’t quite going to pan out as I’d intended. Mostly because I’m hitting 76k words (please to note the spiffy progress bar over there to the right—murmurs of polite astonishment and approbation on your part are perfectly acceptable) but I haven’t hit the final third of the novel yet. It’s already getting long. If I take Ned and Rafe off to Aegypt, then my chances of finishing much under 120k words are not great. And that is far too long for a m/m romance novel. Far too long. So, I have to think of an alternative ending to Gilded Scarab. I already have ideas about that, involving scarabs and the Museum and a rival coffee company, so that’s not a problem other than having to go back and rewrite some bits to accommodate the new ending. But because I very much want Rafe to kiss Ned in the shadow of a pyramid, while mummies roam and jackals howl, while airships chug overhead and aether-powered harquebuses defend them from their enemies, and while they’re lying in a hollow in the sands, looking up at stars so low and bright they can almost touch them, a lion coughs out in the desert, the sound carrying on the warm night air… I’m sorry. Where was I in this complex and difficult sentence? Ah yes. Because I want Rafe to kiss Ned under the pyramid, I really do have to write something where they’re in Aegypt. A sequel beckons. I have some bits and pieces written I can use there, and I have a title. At some point in the next year, The Dog Who Swallows Millions will be written and take our heroes on some (yet undefined!) adventuring amongst the tombs of the Pharaohs. But it will involve mummies and grave robbing and a serious attempt to assassinate Ned and implicate Rafe. Sigh. You know, this sort of thing wouldn’t happen to me if only I did concise. On another note, the first batch of my new pens has arrived from the US and they are gorgeous. Honestly, I’d never buy promotional pens here in the UK. The US company has a huge range of very affordable stock, heaps better than anything you can buy here. The only problem is that the US company doesn’t do overseas trade, so I have to get a lovely friend there to buy them and ship them. So a huge thank you goes to artist and sculptor Shelley Hunter for being a true friend. Go and check out her website and admire her work. Next Is it summer yet? If you want a set of these specifically, then send me your address to my email or PM it over Facebook, and I’ll send you a set. If you’re wondering where I got them from, then it’s http://www.pensxpress.com/ They’re really nice, aren’t they? I’m so pleased with them. Ha! 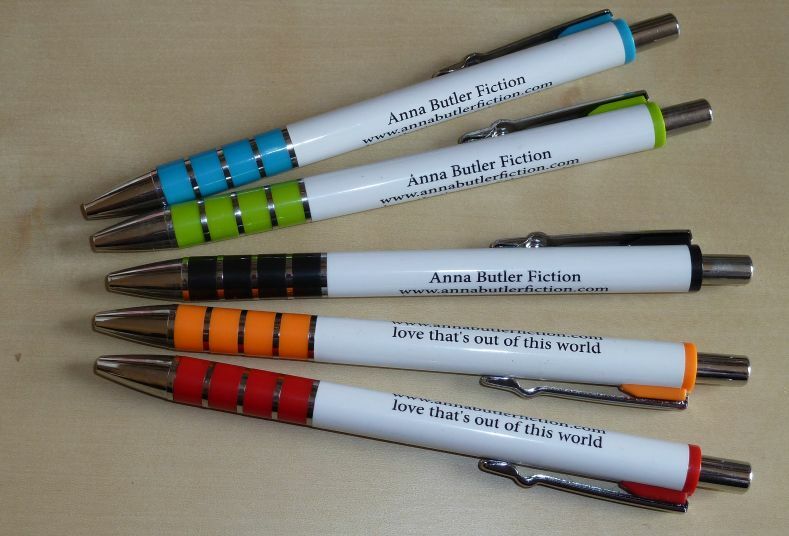 I love the pens, Anna! Rainbow-hued! And welcome to the world if the Infamous Novel. That sucker is roughly 177k words, so it definitely needs chopping in half. The problem is, no one can really figure out where to chop. I even asked a certain friend of ours from BSGSlash who used to be a professional editor & she didn’t have any good suggestions. They are indeed rainbow hued, my chicken. It’s hard to know where to break something, isn’t it? I’m having the same trouble about the 4th Shield book, which is going to get split up between books 3 and 5, because I really should ditch a lot of it. Hard. The gay man’s Amelia! It’ll be fun – especially if I can work in more steampunky elements. I browse with Firefox v.28.0 on an HP running Windoze 7, if that’s any help. …then my chances of finishing much under 120k words are not great. And that is far too long for a m/m romance novel. The pens are lovely; I can see why you’re chuffed. Ah – the progress bar is in the right hand column, above the tag list etc. I normally use Chrome, but I checked in Firefox and could see it. Hopefully just a gremlin interfering when you were looking earlier. The pens are just great. I’m delighted with them. And they are such good spellers!